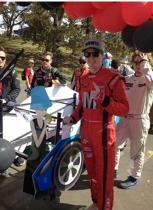 Super-Sized effort from Team V8 Super-Tourer at the Great Auckland Bed Race! The team from M3 Racing found themselves driving another type of vehicle around the Auckland Domain this past Sunday … a bed, yes, a bed, in the Great Auckland Bed Race – and all in aid of Sweet Louise. One of our Sweet Louise ‘chicks’ went along for the ride and we doubt she will ever be quite the same after her thrilling circuit around the course with this team of high-powered race drivers. And the best news of all … Team V8 SuperTourer won the Race, despite having a tyre blow out in the opening stages of the contest. Our proud team of Racers accepted a winning score of $6,000 for Sweet Louise, a fantastic effort. A huge thank you to our racing team for taking out the checkered flag for us. What a day! What a Team!